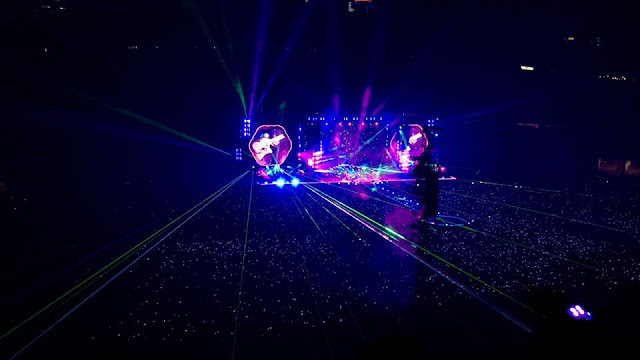 OVERWHELMING is an understatement, that’s my experience at the Coldplay concert in Seoul. Korea is one of the lucky Asian Countries who hosted the “A Head Full of Dreams” concert tour last April 15 and 16, 2017. I was there during their first day performance and I think that was one of the best memories I ever have here in South Korea. When Coldplay announced last November that they’ll have a concert in Seoul, I was devastated because I thought I will no longer be in Korea during the concert date. However, I think I was bound to watch the concert because the Universe has conspired to make it happen. All of a sudden, my stay in Korea was extended, somebody backed out and ended up selling her ticket to me, and the rest was history. After several months of waiting and listening to all Coldplay songs, the concert day has finally arrived. I was so excited that I canceled every plan I had for that date including work. I took the public transportation to go to the venue of the concert at the Olympic stadium in Seoul., as soon as I got off from the Sports Complex Subway Station, I felt something different, something festive, something fun. I know I was at the right place because there were posters about the concert, people were wearing a coldplay shirt and there's a big signage instructing people where to exit based on the ticket. I arrived 4 hours before the start of the concert, that’s how excited I was. As I walked towards the stadium, there were already a lot of people outside the venue, which means a lot of people are more excited than me. Since the gate to the stadium was still closed, people busied themselves buying Coldplay merchandises such as shirts, bags, caps and even keychains. I just thought the merchandises are overpriced, but people buy anyways, and I didn’t. 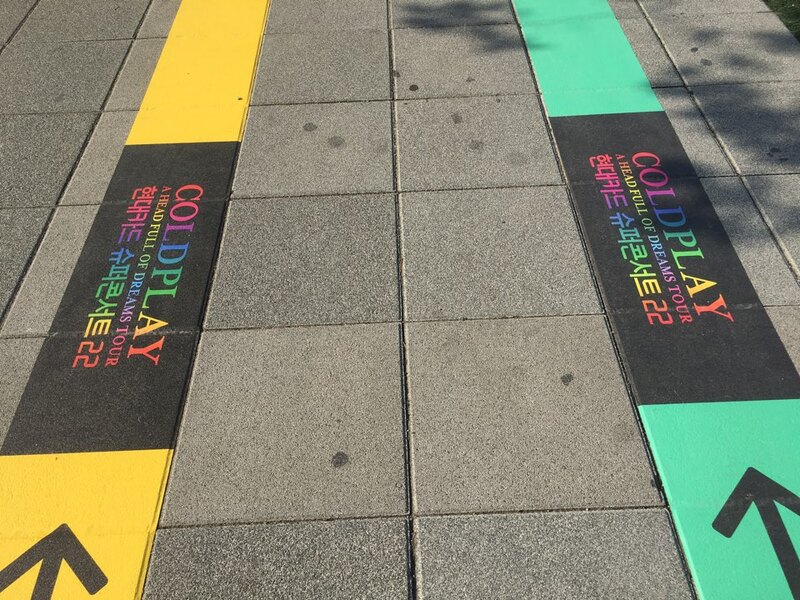 I think the whole area outside the Olympic Stadium was Coldplay-fied. Aside from the Coldplay merchandise booths, there were ticket booths where people can claim their tickets. There’s also a big screen featuring photos and videos about Coldplay and few samples of their songs which they repeatedly play all day long. There’s also a giant Coldplay board towering at the walkway with directions printed on it which I think very convenient for the concert goers. I was wondering why there’s a long line for the Coldplay board, and I found out later on that it was actually a photo opp area where you can take a photo and use the giant signage as a background. I found it weird, but I lined up anyway. I just realized how organized and systematic they are in handling that big event. In every corner, they assigned somebody to usher people and to make sure that everything is going with the flow. An hour before the concert, people started to flock toward the entrance of the stadium. I and my friends decided to get in the venue as early as possible to avoid the crowd. They were very strict at the entrance. They don’t only check the ticket, they also check bags because there were prohibited items like DSLR camera, drinks, fireworks and more. As soon as we entered the venue, we were given a badge and a xyloband. We were clueless about the freebies, but we accepted it anyways, I mean, who doesn’t like freebies, right? I was a little bit sad because the tickets that we bought were for the upper bleachers, but on a positive note, we can see everything from that point, and by everything I meant not only the performers but the lucky people at the standing area who will get to see Chris Martin’s performance in a closer perspective. In a matter of 30 minutes, I saw with my very own eyes as I sat on that far flung area how the crowd gathered and grew bigger, and bigger and even bigger. At exactly 7 pm, the concert had started. Front act performer Jess Kent took the stage with her charm and adorable voice. Although not a lot of people know her, she was able to pull it off. The audience was dancing to the tune of her original music, her performance was not really great, but it was entertaining enough to set us all in a concert mode. After Jess Kent’s performance, there was about 15 minutes break before the Coldplay performed. We expected them to start at exactly 8 pm, but when the clock strikes at 8:01, the crowd started to sing, or maybe yell, a line from Coldplay’s most famous song for the Koreans, the Viva La Vida. I don’t know how it exactly started but the crowd just sang in Chorus “Woahahahah oh, woahahah oh Woahahahah oh, woahahah oh, Woahahahah”, and I admit, I was carried away and I joined the rest of the impatient concert goers. 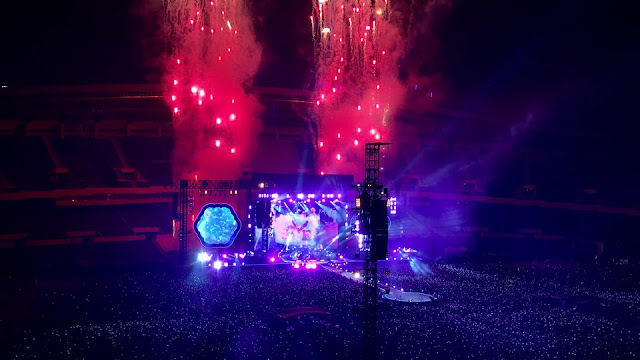 Not long after, Chris Martin came out of nowhere, the rest of the band members were on their respective positions to give us the best concert of our lives. At that instance, surprises happened like a domino. 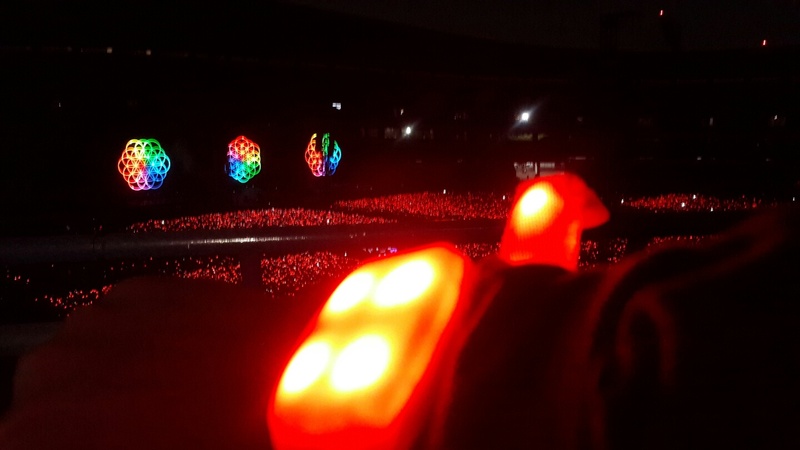 Everybody was shouting when Chris started to sing “A Head Full of Dreams”, the white xyloband that they gave us when we entered has transformed into a psychedelic accessory as it lit up into a red color, imagine the whole stadium emitting red lights from the xyloband, what a sight to see. And not only that, there were fireworks, yes, they have fireworks on stage while the band is performing. I couldn’t explain what I felt at that very moment. I felt like my heart was not designed to register such awesomeness and a small span of time. However, I noticed one of the audiences started a little shenanigan. The guy lit up his own fireworks in the audience, he was in the moment when he started to wave around his sparklers which he managed to sneak inside the venue. The security personnel chased him but he was out there running from them and waving his sparklers. They managed to kick him out of the venue and thankfully, it didn’t cause much trouble in the concert. We just ignored the incident, hey, we’re at the Coldplay concert!!! A performance of an iconic band is meant to be enjoyed, and we did, we really did enjoy it. And that was just the first song. Just like a roller coaster ride, Chris Martin and the rest of the Coldplay band members took us to a new level of excitement as they started to perform their classic hits Yellow, Every Teardrop is a Waterfall, The Scientist, and everybody’s favorite Viva La Vida. Everyone was singing and dancing and just enjoying every moment. 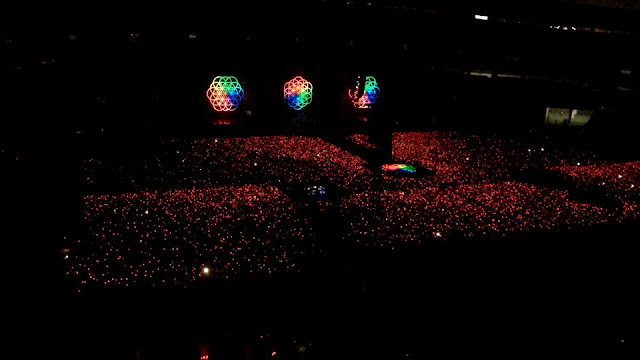 Everytime the song changes, the lights on our xylobands change too. Sometimes it’s red, sometimes it yellow, purple and sometimes it’s blinking and that I felt like I was part of the performance. I really enjoyed when he sang Fix You, Everglow and Charlie Brown, that was some of my favorite performances. And of course, I can’t remember how I managed to dance and freaked out like a crazy fan boy to the tune of their latest tracks Hymn for the Weekend, Adventures of a lifetime, Something Just Like and This and Paradise. Aside from the glowing xylobands, there were fireworks displays every now and then. There’s confetti filling the whole atmosphere of the stadium and helium balloons popped out of nowhere. If there’s anything more awesome than that, I will bet my life. Finally, they performed Up and Up as the finale song, this song reminds me of my 2016 summer in Korea and its music video is my favorite. Everybody was jumping and singing, and I found myself shouting the lyrics, not singing, that’s how I was carried away. When the band gave their bow as a sign of the end of their performance, the audience started shouting “Encore, encore, encore!!! !”, but I guess that’s really the end of it all. A few minutes after the concert, we’re still there, like we don’t have plan to go out, maybe the band will come back and will sing for us one more song, or maybe Chris will show up just to say goodbye, or maybe we just want more. I don’t know, all we know is that, we don’t want the night to end. But all things have to end, including the good one. Just so we could get our fix on it, we started singing in Chorus the Viva La Vida hymn. It was like the anthem of the night. Even in the subway, while we were waiting for our train, people who went to the concert still singing in chorus. It was like a wink wink to say that we all attended the concert and we just had the greatest night of our lives. It was indeed a night full of stars, they all came down from the sky to the stadium to celebrate happiness that is Coldplay. Thank you Coldplay for giving us not only what we want, but also what we need. For in this world full of troubles, we need something just like this to fix us even for just one night. And in the end, we will continue to fill our heads with dreams, a dream for a better world, a better life and happiness.